I had seen mention of share stations starting to popup over the past week, including one at City Hall. Good news for the East End: It looks like it’s finally go time for the bike share, and that the Clay Street station in front of Cylcus bike shop is part of the launch. Anybody know when we’re supposed to be getting the bikes? RVA Bike Share has info on how to sign up for the program and the costs for annual, monthly, and daily passes ($96/$18/$1.75). The site also has a map showing locations for 16 stations and the number of available bikes at each (currently zero). There will soon be an app available that will facilitate the rental process, and show the availability at the kiosks. The site describes the bicycles as “standard bikes”, but also says that “you can ride for a full day and still have battery life left over”, so it sounds like they may include some electric assist. The bicycles come with a horn and a basket capable of carrying 40 lbs. 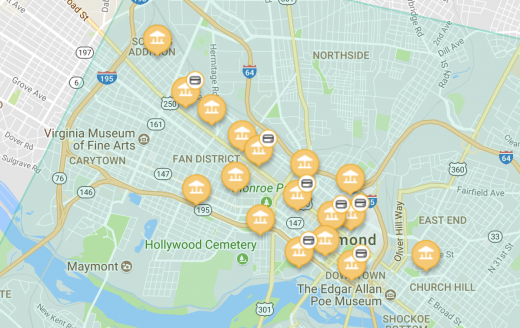 Richmond’s bike share was supposed to launch in 2016 with 220 bikes and 20 stations focusing on downtown and nearby areas, with a Phase 2 in 2017 to add another 220 bikes (including electric pedal assist bikes) and 20+ more stations. The original map from 2015 shows a station on Jefferson Avenue, while the current city map doesn’t show a station in the area until Phase 2. I loved bikeshare when I was in DC and used it all the time. I’ve also used weekend guest passes in other cities like Montreal, Minneapolis and Paris. The DC system has over 400 stations. Minneapolis has 190 stations. Montreal has over 500 stations. I certainly don’t think a city the size of Richmond needs a system as big as those cities. But 20 really isn’t much of a network. There won’t be as many useful destinations to ride to or the redundancy near heavy traffic locations which is critical when docks are full or empty. I think they should have started with closer to 40 stations. I’m not sure the initial investment will be enough to build a base of users that will trigger sufficient ridership to garner support for expansion. We shall see. As for all the “gotcha” questions I typically see in comment sections of Richmond Times Dispatch articles on the bikeshare system. Conservatives who have never tried bikeshare or even read the FAQ of a bikeshare website think they’ve figured out a reason why bikeshare could never work because of insurance, theft, liabilty, etc… Nope, bikeshare may be new to Richmond but it is not a startup technology. It is in hundreds of cities worldwide. All the basic questions of that type have been solved elsewhere and best practice solutions exist. Super nice! Thanks Cyclus Bike Shop! Note: read "by Cyclus Bike Shop" as "adjacent to Cyclus Bike Shop"
My ADD obviously kicking in (didn’t read the full article). Mayor Levar M. Stoney will launch the RVA Bike Share program on Tuesday, August 29 at 9 a.m. at Kanawha Plaza and lead cyclists on a 2-mile ride from across the Manchester Bridge to the T. Tyler Potterfield Bridge, ending at Browns Island. Richmond has teamed up with Canada-based Bewegen Technologies Inc., an industry bike share leader, to supply the bicycles and docking stations. The equipment will be maintained by Corps Logistics, a Baltimore-based firm owned and operated by military veterans. The initial phase includes 220 8-speed bikes and 20 docking stations located throughout the city. A second phase is expected to be implemented in the coming months, doubling the fleet and including electric assist PedElec bikes, making it easier to ride uphill. These hi-tech bicycles will be equipped with a color screen, live GPS and can be unlocked through a mobile app. 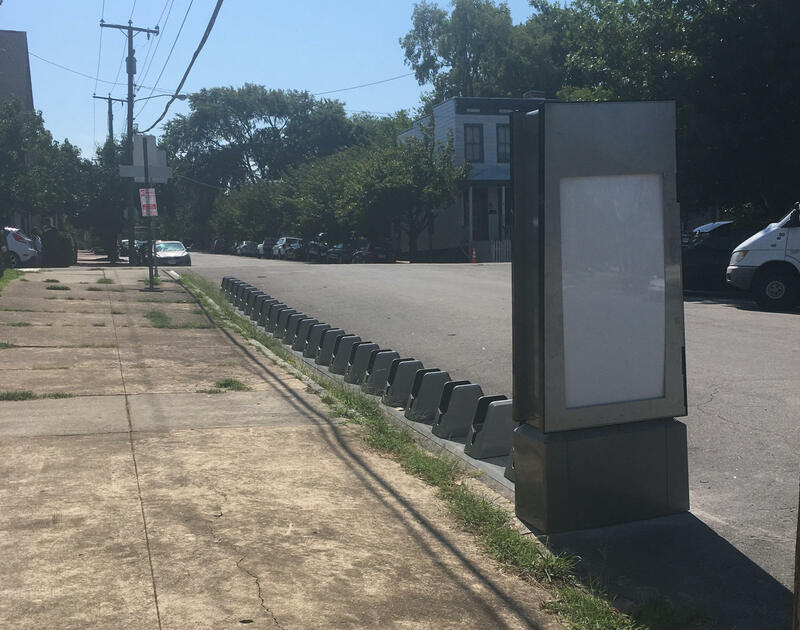 RVA Bike Share is a public-private initiative, and Mayor Stoney has written a letter to encourage Richmond’s corporate and business leaders to engage in sponsorship opportunities necessary to ensure the long-term sustainability of the program. Click here to read the mayor’s letter. Plans for RVA Bike Share have been in the works since 2012. The city was awarded a $1,064,000 federal Congestion Mitigation and Air Quality grant in 2014 to start the program, supplementing $280,000 in capital improvement funds made available by the city. One-way trip and daily passes will be available as well as weekly, monthly and yearly memberships. For more information about RVA Bike Share, pricing, membership and sponsorship opportunities, please visit rvabikes.com. 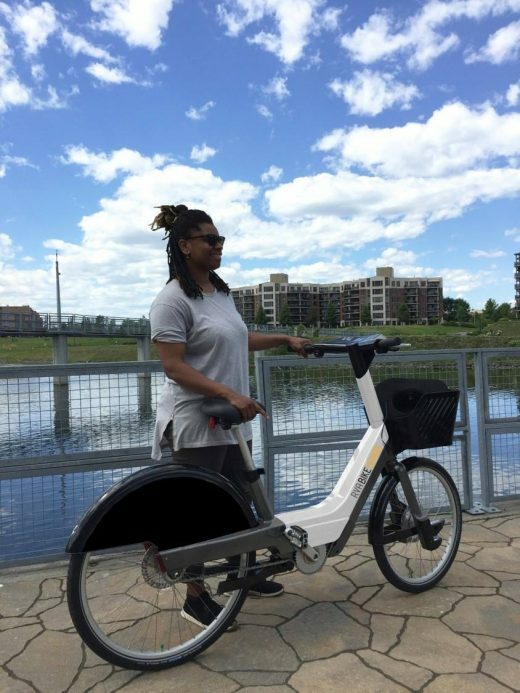 I think this is a neat and the idea of bicycle as opposed to, Segways or walking, is extended mobility to see more further away. The problem is that the City of Richmond has never grasped the concept of a “historic tourist destination”, nor promote it. And if the monuments come down, that will be even less for people to come and see. My concern is vandalism (as we know is rampant in our city), theft, and sanitation. Cyclus Bike Shop did not install this station. neither the city, nor the private company itself consulted Cyclus Bike Shop about it’s installation, despite the bike shop’s pre-existing rental fleet. Why would the city/private company need to consult with Cyclus? If the concern is that it may hurt the existing bike rental business, welcome to the competitive open market economy. Sorry Johnathan, but a government subsidized bike fleet is not competitive open market economy. The concept is a good one but small business needs our support.